The debut cookbook from NYC's viral sensation Black Tap delivers unique recipes for innovative burgers and sensational, over-the-top milkshakes. Black Tap is no ordinary burgers-and-fries restaurant—after opening in NYC's Soho in March 2015, their bold, gourmet-flavored burgers and sky-high milkshakes adorned with donuts, sparklers, and oversized cookies have created amassive cult following on social media and the streets of New York, with people waiting in line for hours just to score a seat at the restaurant's lunch counter. Though Black Tap is known for its assertive flavors and outrageous shakes, at the heart of the brand is the notion of an old-school luncheonette burger deluxe: an expertly prepared burger with all the trimmings, a side of fries, and a milkshake to cap off the meal. 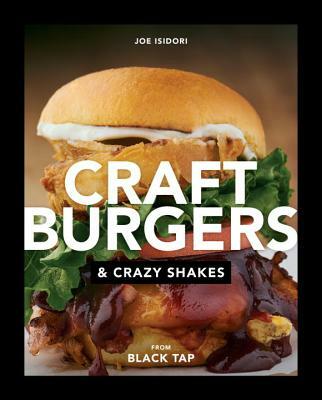 In his debut cookbook, Black Tap chef-owner Joe Isidori delivers 40 recipes for the restaurant's signature burgers, tasty condiments and toppings,and gravity-defying milkshakes. With Craft Burgers and Crazy Shakes, readers will be able to prepare and enjoy all of Black Tap's classic and innovative creations, from their Old Fashioned Burger to the Sour Power Milkshake, in the comfort of their own kitchens, no standing in line required. After graduating from The Culinary Institute of America, Joe Isidori went on to work at Nemo Restaurant and then oversaw the dining concepts for several restaurants in the Trump empire, including Trump Golf Management, the Mar-a-Lago Club in Palm Beach, and DJT at the Trump International Hotel in Las Vegas, for which he was awarded a Michelin star. Isidori returned to NY in 2011 and is the chef/owner of Black Tap. He lives in New York City.